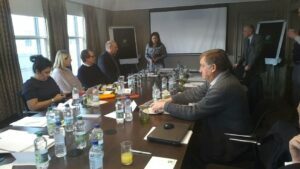 Hotel Solutions Partnership Associates came together for their annual conference on Tuesday 30th January at the Holiday Inn London Mayfair. With 30-plus consultants based all over the world, it’s never easy getting us all in one room at any one time, but the annual conference was well-attended and provided the perfect forum to discuss current economic conditions, market trends and how to promote Hotel Solutions Partnership’s skills and expertise in today’s hospitality industry. Katrina Craig, CEO, gave an overview of the last year and set out objectives and targets for the year ahead. David Atkinson, VP Business Development, presented on the partnership’s extensive sales and marketing strategy and David White gave a financial business analysis of the last year. The day wrapped up with a lively Q & A – much to be optimistic and excited about for HSP in 2018!